June 2015 – Many great things have been happening in the café lately – from big bad lunches whipped up by our own Technical Director, Remington North, to popsicle making by the awesome duo Eric & Mia. There is never a shortage of community activity here. Not to mention we’re shopping for new furniture because more often than not you’ll find yourself snuggling up to a stranger to drink your latte. We’re that busy! To highlight the wizard that graces us with her presence on a weekly basis to stir up incredible treats, I’ve conducted a little Q & A with our baker-in-residence. Nicole Bilyea has given us a few tidbits about herself, her creativity and the magic of baking. Q. What got you interested in baking? A. Probably my dad! He makes the world’s best apple pie and though I’ve yet to match it I have been trying to achieve the same ability to throw together a pie without any measurements or instructions. Q. Do you have a baking philosophy? A. Experiment, use creativity to reduce waste and let the flavours of the season and the location shine. The joy for me is in learning as I go and sharing. Q. How do you see baking as a creative outlet? A. Baking is all about stirring together bowls of these chemistry processes and playing with how they interact. I love to combine parts of different recipes together and make my best guess about how it’ll come together. Baking is sensory, aesthetic, therapeutic, playful and connecting- these are all elements I enjoy as part of any creative endeavour. Q. What was your first baking memory/experiment? A. My first baking memory is picking blueberries at my dad’s work- he works in agriculture- and having him show my sister and I how to pick, wash, and sugar the berries for a pie we made later in the day. While we made the pie he showed me how to handle the pastry with care and a light hand and gave me a very in-depth lesson on blueberry horticulture. Q. A baking nightmare? Tell us about a time when it went terribly wrong. A. When I was working in Canmore as a baker a couple came in with a wedding cake emergency- they were getting married that afternoon but their cake wasn’t going to get there on time. They asked the owner to make her signature carrot cake but she had no time to do it and passed it on to me. The cake turned out fine but it was 40 degrees in the kitchen and the carrot cake icing was melting all over the cake. I had to pop it in the freezer every 10 minutes but the couple left happy and I think we still achieved a ‘rustic’ look? Don’t tell this story to a group of teenagers hooked on ‘Say Yes to the Dress’ though, they will look at you with horror in their eyes. Q. What’s something you want to try but haven’t had the opportunity to? A. I would love to master the croissant, or find a less time-consuming way to make them. It might be a little blasphemous to pastry purists but I keep having visions of frozen butter layers embedded with yummy herbs and edible flowers and wondering what they would do in a little roll-up. Q. Dream job? Doesn’t have to do with baking. A. A scout group leader for youth who love music, art, nature, justice, utter silliness, making food, and talking about feelings. Or maybe I’d just like to sign up. The Theatre Centre Café/Bar is open daily, Monday to Friday 8am-4pm, Saturday & Sunday 9am-5pm. Starting July 6th, you’ll have a daily selection of tasty sandwiches and salads to choose from, care of Parts and Labour! Photos (t to b): 1. Slider image: Chocolate hazelnut frangipane squares, The Theatre Centre anniversary cake (Ontario strawberry, dark chocolate, and caramel pretzel cake with Swiss meringue buttercream and white chocolate airplanes), potato rosemary scone with aged cheddar. 2. 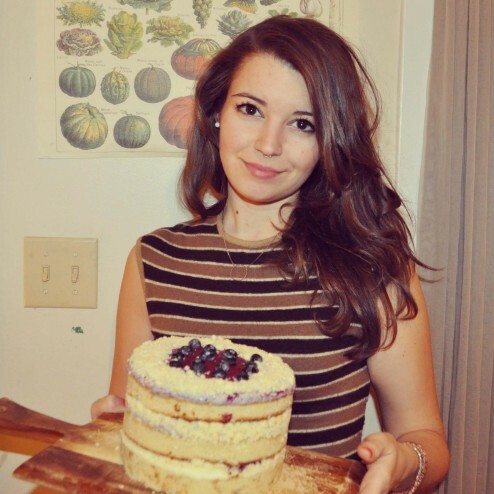 Nicole Bilyea and cake. 3. 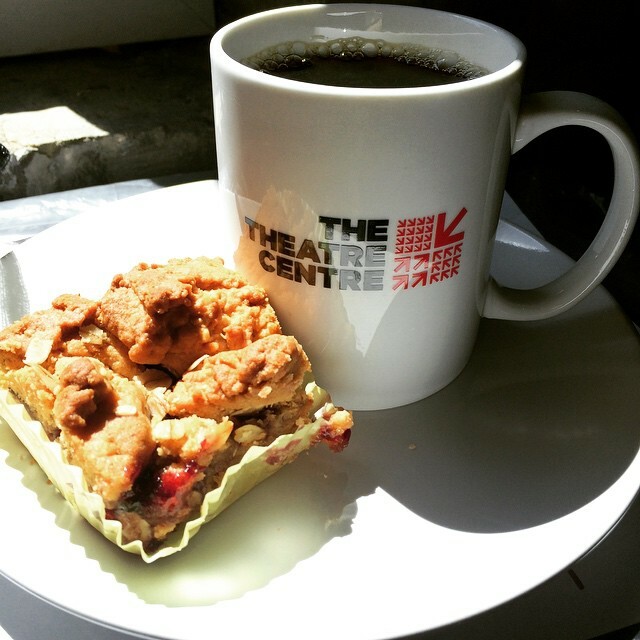 Peanut butter and jelly square and coffee. 4. 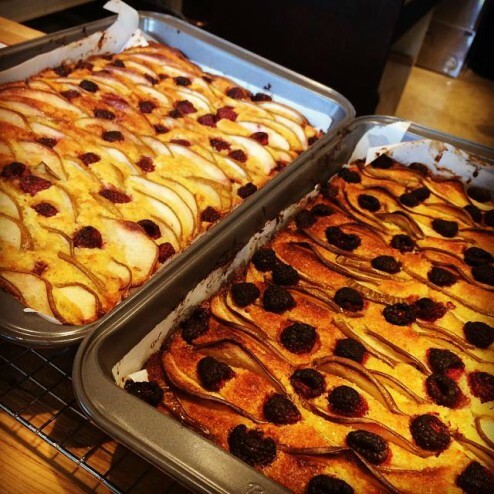 Pear and raspberry frangipane tarts. 5. 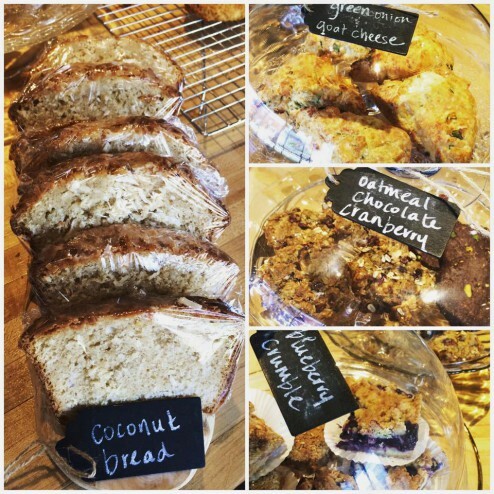 Coconut bread, blueberry crumble squares, oatmeal chocolate & cranberry cookies, green onion and goat cheese scones. 6. 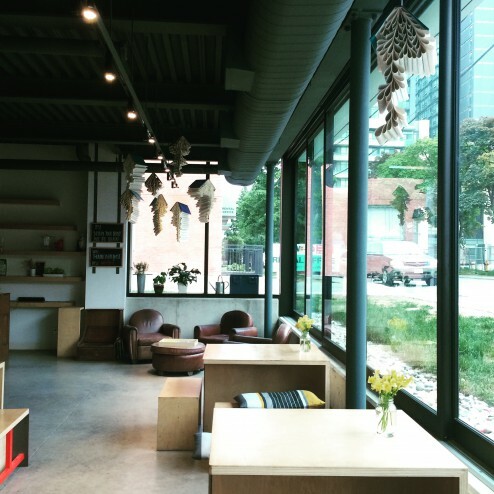 The Theatre Centre Café/Bar featuring a hanging installation by Kalpna Patel, part of Side Streets, an ongoing collaboration with City of Craft.